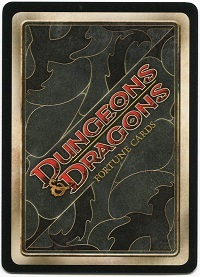 Fortune Cards were originally released by Wizards of the Coast to support the in-store D&D Encounters program. These cards, sold in random booster packs, provide one-time (mostly combat) benefits to characters when cards are played at the table. Originally intended to serve as a deck that a player draws from once per round, crafty DMs can re-purpose them as a reward mechanic in their 4th Edition D&D games. Many DMs like to reward players with something extra when they go out of their way to contribute to the fun at the table. Some award extra experience points, others use bonus Action Points, still others grant bonuses to the next die roll. Fortune Cards offer a fun mechanic for rewarding players in a unique and random way that ties in directly to 4e mechanics. Plus, if you have some around just gathering dust, you might as well get some use out of them. To construct your reward deck(s), you will need to purchase some Fortune Cards. There were five different sets of card printed: Neverwinter, Shadows Over the Nentir Vale, Fury of the Feywild, Spiral of Tharizdun, and Drow Treachery. You will primarily be interested in getting cards from the Neverwinter, Shadow Over the Nentir Vale, and Spiral of Tharizdun sets, as they are mostly setting/theme agnostic. Each set contains 80 unique cards: 20 designated as common, 20 as uncommon, and 40 that are rare. A standard booster pack for a set contains 8 cards made up of 5 common, 2 uncommon, and 1 rare. A handful of promo card were also printed for each set. Booster Packs: At a suggested retail of $3.99, these packs of 8 cards average to about 50 cents per card. Display Box: You can find retailers that will sell an entire display box of Fortune Cards for $40 to $70. A display box contains 24 packs (for a total of 192 cards), so this averages out to about $1.50 to $3.00 per pack (20 to 40 cents per card). It’s a good way to get a lot of random cards at once at a slight discount, but you still won’t get a complete set of unique cards (more than likely you’ll get all of the commons and uncommons, and a third or half of the rares). Complete Sets of Common, Uncommon, Rare, or All: Some online retailers as well as sellers on eBay sell complete sets of cards by rarity or even the entire set. This is a practical way to ensure getting all of the unique cards in a set, but you will only have one copy of each at slightly higher cost per card. Complete sets of Common and Uncommon together tend to be around $5.00 (about 12 cents per card), full sets can range anywhere from $60.00-$100.0 ($0.75 – $1.00 per card). Individual Cards: Individual cards can be purchase at some online retailers and eBay, which can be useful/economical when trying to complete a set or cherry-pick a few cards from some of the other sets like Fury of the Feywild. Prices vary, but a good baseline seems to be 10 cents for commons, 25 cents for uncommon, and $3.00 for rares. Depending on how many cards you have and personal preference regarding how you want to reward players, there are several ways to set up one or more reward decks for use at the table. I have presented several here, feel free to choose one that suits your play style best (or come up with your own). Regardless of which method of deck construction you choose, you should start by selectively weeding your pool of available cards. Any cards that don’t seem like the players would find very rewarding or useful. (e.g. “Push Through The Crowd”, which allows a character to move through enemies but incurs attacks of opportunity with combat advantage). Cards that have very specific conditions under which they can be applied (e.g. “Vicious Shove” which triggers on an enemy succeeding a saving throw to avoid forced moved into hindering terrain). If you have a good sense for what your player characters (and monsters they might face) can do, remove any cards that target conditions/abilities that aren’t likely to come into play (e.g. “Brutal Takedown” which requires the ability to daze an enemy). You can always add these cards back in later. Any cards that just don’t fit with your game thematically, etc. Selectively pruning cards in this way will help to ensure that the Fortune Cards you hand out actually feel like rewards (or at least provide new and interesting options). This is the easiest reward deck to construct: You simply gather all the cards you plan on using and put them in one shuffled pile. It’s fast and easy to set up, but you may find that drawing from it results in rewards that don’t often match the player’s contributions (for instance, a player may make a huge sacrifice but be rewarded with a common card with a small effect). Also, if you purchased just a complete set of cards, the ratio of common, uncommon, and rare cards will be skewed toward rares (sets contain twice as many unique rares as commons and uncommons). With a little more work you can make it into a deck of all unique cards, or play with the card ratios to affect the distribution of cards. Constructing the reward deck such that it only has one copy of every card ensures that every reward you hand out, and every card that is played, is unique and different. Include 1 of each rare card, 3 of each uncommon card, and 5 of each common card. Since there are more rare cards to choose from (each set has 40 rares, compared to 20 each common and uncommon), the ratio of cards will actually be 2 rares, 3 uncommon, and 5 common per 10 cards. Include 4 of each common card, 2 of each uncommon card, and choose (or randomly draw) a number of unique rare cards equal to ¼ the total number of common cards you’ve included. This method makes uncommon cards twice as numerous as rares, and common cards twice as numerous as uncommon (and four times as numerous as rares), but still keeps the total deck size somewhat reasonable. Again, the reward a player gets from the deck is random (in terms of how powerful it is), though in this case you are setting the power ratio of reward cards in the deck. If you want more control over the power of the rewards you’re handing out, you can opt to create multiple decks sorted by rarity (e.g. a common deck, an uncommon deck, and a rare deck). When it comes time to hand out a reward, you choose which deck to pull from based on how great of a reward you think they have earned. You can use all of your cards, can make each deck contain only unique cards, or play with the ratio in each deck to control how many copies of a card are out at one time. If you want duplicate cards at the table, but want to control the frequency of cards based on their rarity, do the following: In your common deck, include 4 of each common card. In the uncommon deck, include 2 of each uncommon card. In the rare deck include 1 of each card. Since you are determining the rarity of cards at the table by rewarding the players based on merit, these ratios instead control the likeliness that more than one person at the table gets the same card. Another formula would be to include 1 less than the number players of each common card, and half that number of uncommon, and one rare. This method takes the most time and effort to construct the decks, but gives you the most control (and is my current preferred setup). Although the rarity assigned to each Fortune Card gives some sense of its power, it doesn’t always correlate with how good the card is from a player’s perspective. The play style of you and your players may make some cards better or worse than the rarity suggests. For example, a rare card that provides bonuses on opportunity attacks isn’t very valuable if, as a DM, your monsters rarely provoke attacks of opportunity. With that in mind, you can take the time to go through all of your cards and sort them into a few categories based on how valuable you think they actually are, without regard to rarity. Average: These are cards that have a decent benefit, but perhaps not as good as some of the other cards. These cards tend to be more conditional (that is to say, they don’t just provide a blanket bonus for free) or they require the player to take some kind of penalty or disadvantage to one thing in order to gain a bonus in another. Cards of the latter type are often categorized as rare but I consider them less valuable to players than a card that just provides a straight bonus with no caveats. “Shifty Moves” – Allows you to shift 1 square as a minor action. This could come in handy, but isn’t something that’s good no matter the situation. “Think Again” – Grants you +4 bonus to defense against an opportunity attack. This is conditional, it requires an opportunity attack. “Keep At It” – Allows you to reroll an attack roll, but you take damage equal to your level. This card is useful, but comes with a cost. Good: These are the cards that either always provide a benefit with no prerequisites, or require common enough circumstances as to be good in most combats. It may be easiest to decide what constitutes a good card first and then what makes an average card by comparison. “Impervious” – Allows you to turn a critical hit into a normal one. This is conditional (you have to be hit with a critical) but provides a considerable benefit. “Fair Fight” – +2 bonus this turn to attack rolls of your At-Will powers. Gambler: This is contains all the cards whose outcome depend on either a simple 50/50 die roll or provide a benefit for success and a penalty for failure on a die roll. I decided to put these in a separate deck based on my players–some find the idea of taking the risk to reap the reward interesting, others like to play it safe and would be less inclined to risk it. Putting these cards in a separate deck allows me hand out these types of cards only to players who I think will be likely to use them. “Gambler’s Eye” – Roll a d20, on 1-9 you take -2 to attack rolls until end of this turn, 10-20 you gain +2 to attack rolls. 55% of the time this works in the player’s favor, but it’s not guaranteed. “Seize the Opening” – When an ally adjacent to you misses on an attack you can shift 1 square and make a basic attack for free, but if you miss, that ally takes damage equal to your level. Here there is a benefit but also a cost associated with failing a die roll. It should be pointed out that even though I sorted the cards based on usefulness, I still tried to make sure that all of the cards were useful in some way, there are just some that provide a better benefit than others. The Fortune Card sets Fury of the Feywild and Drow Treachery are generally not well-suited for inclusion in the reward decks because of their themes and mechanics–magical effects in the former and “harm another character” in the latter–though one could cherry pick a few here and there. However, they could be used as their own special reward decks if they meet the theme of your game (an evil drow campaign, for instance). The Fury of the Feywild set contains many magical and unusual effects which are not well suited for all classes, but could make interesting rewards for magical or fey characters in your game. And of course if you’re running an adventure in the Feywild, you could give these rewards to any character, explaining the effect as being tied to the environs. It probably isn’t worth the time and effort to sort these themed decks into multiple ones based on rarity. Instead, choose one of the methods above for creating a single deck instead. The randomness of the draws fits with the flavor of the deck. Now that you have a deck or decks from which to draw cards, here are a few rules for using them in play. You should modify these in any way works best for your game. Note that we are disregarding the standard rules by which Fortune Cards were used during D&D Encounters as we are re-purposing them to fit our needs. When a player has earned a reward, draw a reward card from one of your reward decks and hand it to them. If you are using multiple decks, choose the one that best reflects how powerful a reward (or whatever criterion you’ve used to sort your decks) you think they deserve. Give it to another player. Discard it and draw another if the player genuinely cannot use the card (e.g. it relies on an effect they cannot produce, like daze). Optional: Discard it and draw another if the player already has a copy of that card. Rule 2 can be explained in-game as the receiving player emboldened or awed by the deeds of their fellow adventurer. As a game mechanic, it allows players to spread out rewards among the party and help their allies, or distribute rewards to players who could best use them. Once a player has made the initial decision to either keep or give a card to another player, reward cards cannot be traded or passed between players. A player can play only one Fortune Card per turn, but there is no limit to the number that can be played per encounter. If a player has 5 cards, do not reward any more cards. You can optionally allow them to discard a reward to get under 5. Five is an arbitrary number, chosen simply to make the number of cards in front of a player manageable. You can optionally force a discard of reward cards at certain intervals if you want to attempt to encourage quick use of cards. This depends greatly on your game. One possible interval would be at the end of each encounter. Making you or the table laugh. Getting food for the group. Being on time and ready to play. Doing something not because it’s the ideal choice, but because it’s the one that makes most sense for their character. Making a sacrifice in the name of roleplaying. Contributing to the campaign wiki. Doing something awesome and inspiring in game. Enhancing the game in any way. This is just a small list of examples to get you thinking about rewards, but ultimately it’s easier than following a list: just go with your gut. Any time you feel like someone at the table deserves a little something extra for whatever reason, hand them a card. Fortune Cards were designed for use during combat encounters and as such contain benefits that are rarely useful outside of combat. If you want to provide benefits for the overall game instead of just one part of it, you have a few options. You could introduce a rule that outside of combat a Fortune Card can be redeemed for some blanket effect (e.g. an automatic 10, a bonus, or a reroll of a skill roll) or some similar mechanic. You could also make your own reward cards (printed on card stock, taped to unused cards, or printed by an on demand card company like Superior POD) and shuffle them in with the others. 4th Edition D&D already provides a large number of tactical options to players, so including another hand of cards for them to factor into their decision-making can potentially slow the game down or add unwanted complexity for some players. I wouldn’t suggest using them right away with new players or a new group to prevent information overload. With an establish group, try them out for a few sessions and then ask your players if they like the mechanic or if it adds too much overhead. My suggestions for how to use Fortune Cards as player rewards are just that: suggestions. If you like the concept, run with it. Change it in whatever way works best for your game.